A Russian YouTuber machined four pistons for his VAZ-2106's 1.6-liter inline-four engine, installed them, and tried to run the engine. It goes about as well as you might expect. We’ve probably all heard a variation of the tale of the man who bought a nicely-running used car, drove it around for a few weeks, and then noticed the engine starting to run rough. Keen to figure out the issue, the story goes, the man removed the cylinder head and found that a piston had been swapped out for a cylindrical piece of wood! 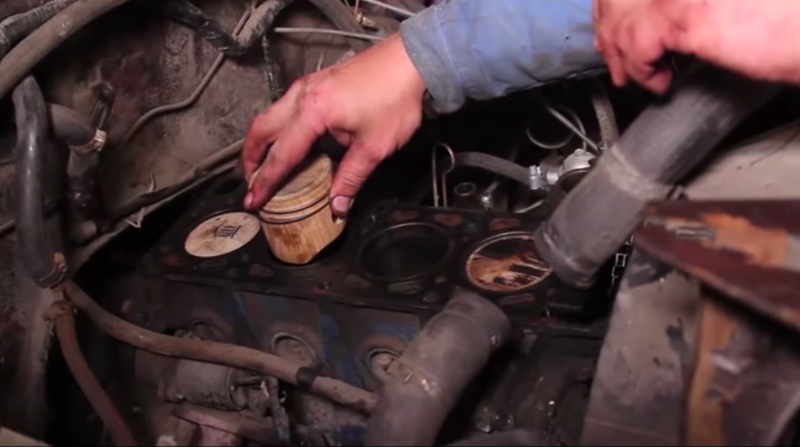 In the video above, the gentleman’s pistons initially soaked up oil, fuel and maybe even a bit of coolant that got into the cylinders, causing the ash wood to swell. This squished the piston rings, preventing them from sealing properly against the cylinder wall, yielding no compression. No compression means no combustion, so the Russian host had to extract the wooden pistons, widen the piston ring lands with a pocket knife saw, and then re-install the pistons and rods. Compression was still rather low, but the host decided to try to run the engine anyhow, turning the engine over by simply towing the vehicle while it was in gear. According to the mechanic, the engine ran for about 15 or 20 seconds before the pistons burned through (it’s hard to tell from the video). Not a particularly surprising result, if we’re honest.